I can't wait to help you through this process! Please feel free to email me any questions you may have prior to our consultation and tasting. Can't wait to meet you! After your inquiry, steps 1-6 should take approximately 2-weeks to finalize. We work quickly to secure dates with our couples because we'd hate for you to miss out due to a scheduling error. You and your fiancé go over the details of this page and discuss what works best for you and your budget. Contact Kat, your personal Hopscotch wedding coordinator with any questions and schedule a 30 minute consultation. Meet at Hopscotch! Please bring any relevant materials, photos, etc. and we'll see if it's a right fit! Schedule a tasting! All tastings cost $15 and include your choice of 3 cupcakes! We will need a minimum of 48 hours for all tasting orders. For full-service tastings and consultations there is a minimum $400 investment. Dessert selections are made and Kat will send you a quote for the full dessert order (including extras like delivery, set-up, and rentals) and a contract to sign stating you read and understand our policies. 20% retainer is to secure your date in our schedule— and you’re good!! Three weeks prior to your event you will receive an email with your remaining balance and any changes needing to be made before final payment. Day-of timeline is sent to Hopscotch- which we will base our delivery times on. Even if we are not delivering, we will still need this. Final payment due 14 days prior to the event— and you’re done!! Here’s the best part of planning your event! Our cakes and icings are made with all natural ingredients—available in gluten-free. Most are nut-free unless specified. Please let us know your ingredient needs before you come in. These are not the only flavors available- but they are our favorite. If you have something else in mind- please let us know. Flavors are listed from the lightest to the very most decadent. If you have any inspiration or photos of cakes you like- please send them our way! A light and fluffy cake made with real Champagne. Pairs well with berries! Looking for something else? Just let us know! Traditional tiered cakes are a lovely centerpiece for a wedding and can be made to reflect the personalities of the bride and groom. Please check below for tiered cake options. As an addition to your cake or to create a stunning display on their own, our petite desserts are made with all natural ingredients. Most are nut-free unless specified. A $400 minimum order is required with no less than four dozen per dessert. In order to reserve a custom cake for your event date, a 20% nonrefundable deposit is required. Without this deposit, we cannot reserve your event date. If the event is rescheduled, your deposits can be transferred to the new event date. This transfer is dependent upon availability and expires within three months of the original event date. Once the nonrefundable deposit is processed, a full invoice and detailed design of your cake will be emailed to you for confirmation. Design changes can be made up three weeks before the event. 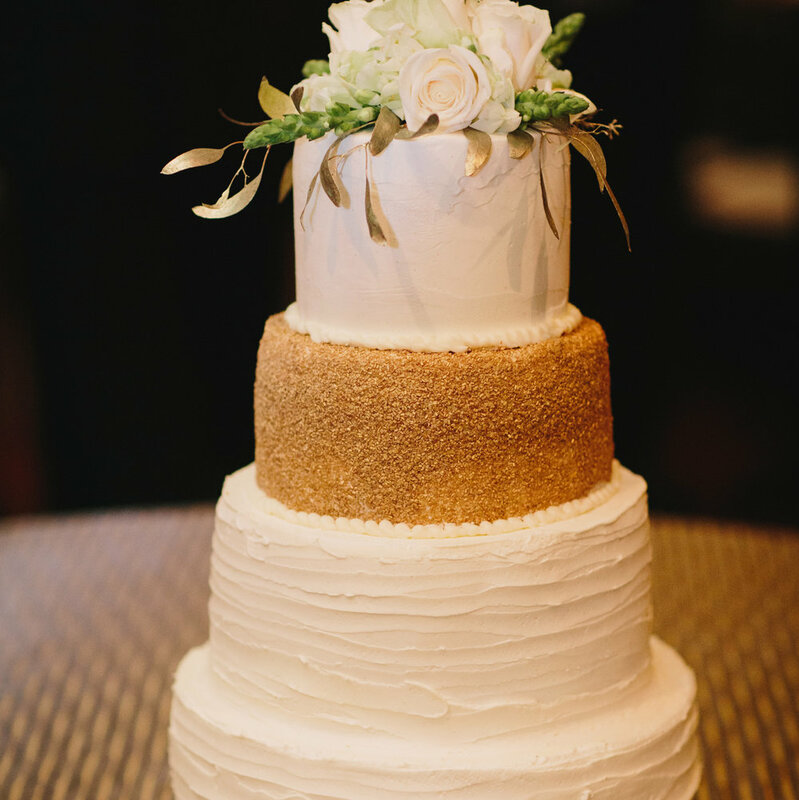 Hopscotch will not provide a wedding cake when sheet cakes, cupcakes, grooms’ cakes, cheesecakes, cake pops, or any other dessert items are provided by any other vendor without our permission. 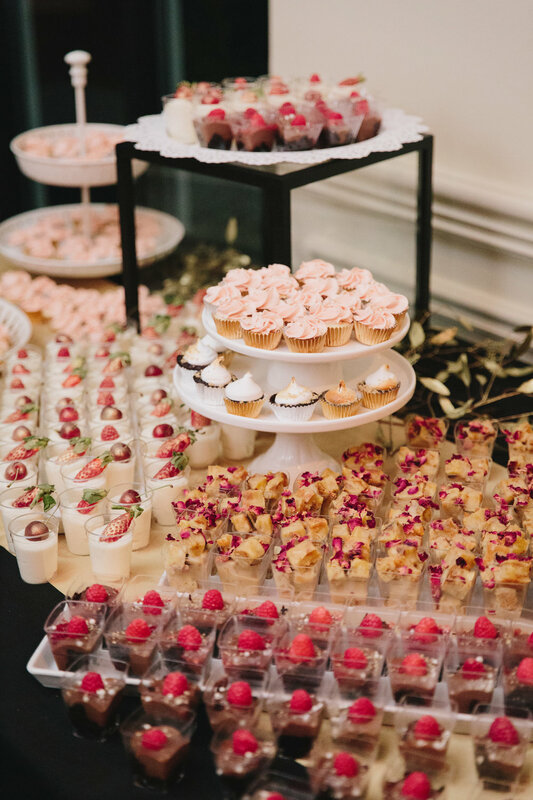 Any desserts placed outside during an event has the possibility of melting or changing form due to weather conditions (such as, but not limited to, heat, wind, rain, and humidity). We are not liable once it has left our premises. Delivery fees will be assessed on an individual basis but start at $50. 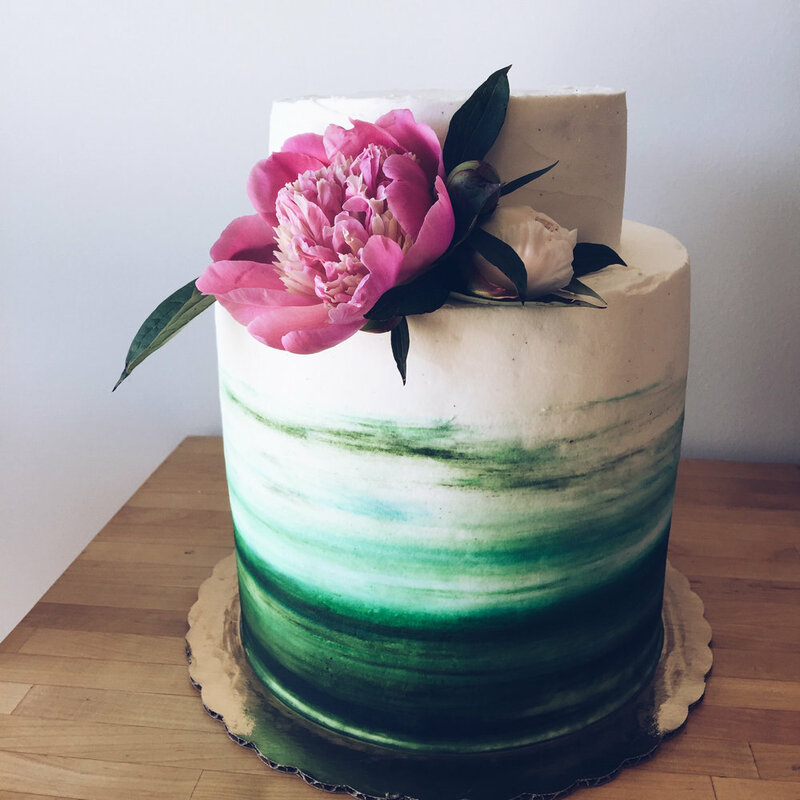 Every cake is handmade by our pastry chef and is subject to artistic interpretation. You may provide us with photographic inspiration for your order. We reserve the right to make minor changes to the design at any point in the process in order to benefit the aesthetic, as seen fit by our cake decorators. We make every effort to match your colors. However, to get as close as possible, please provide us with a color swatch. Also, food-grade dyes may sometimes be difficult/impossible to match. Darker colors have a tendency to darken further with time, humidity, and heat. Therefore, we cannot guarantee a perfect color match. Cake stand + platters, etc must be returned within two business days of the event conclusion. Customer agrees to pay full replacement fee if these are not returned on time and/or are returned damaged (not in the condition they were given).